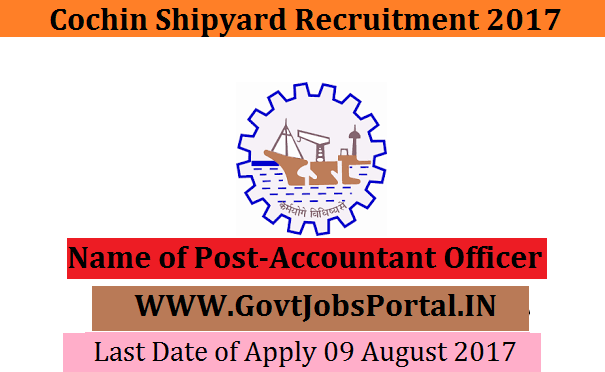 Cochin Shipyard is going to recruit fresher candidates in India for Accountant Posts. So, those candidates who are willing to work with this organization they May apply for this post. Last Date of Apply 09-August-2017. Total numbers of vacancies are 04 Posts. Only those candidates are eligible who have passed Graduate with M.Com and Seven years experience in Finance/Accounting in a Government Establishment / Public or Private Sector Undertaking Graduate with a Pass in CA/ICWA intermediate examination with Five years experience in Finance/Accounting in a Government Establishment/ Public or Private Sector Undertaking. Indian citizen having age in between 20 to 40 years can apply for this Cochin Shipyard Recruitment 2017. Educational Criteria: Only those candidates are eligible who have passed Graduate with M.Com and Seven years experience in Finance/Accounting in a Government Establishment / Public or Private Sector Undertaking Graduate with a Pass in CA/ICWA intermediate examination with Five years experience in Finance/Accounting in a Government Establishment/ Public or Private Sector Undertaking. What is the Process for Selection this Shipyard job? 2: Selection will be held on Descriptive Test. What is the Application Fee for these Shipyard Jobs in India?